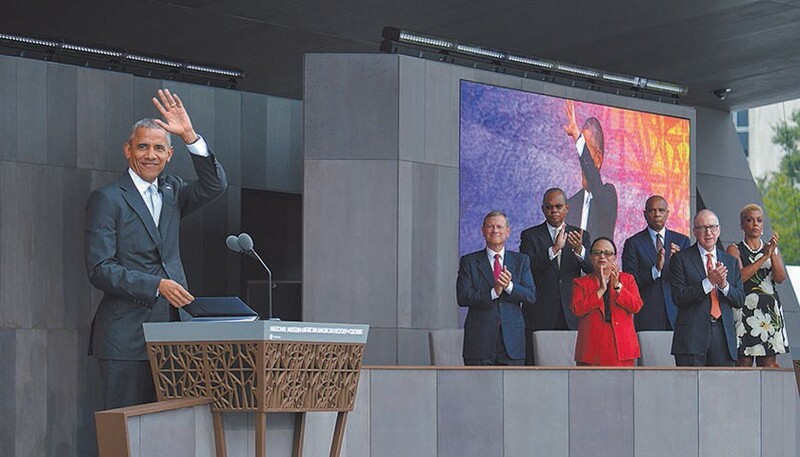 On Saturday, Sept. 24, with the ringing of a bell borrowed from the First Baptist Church of Williamsburg, Virginia, founded in 1776 and one of the nation’s oldest Black churches, President Barack Obama offi- cially dedicated the newest addition to the family of Smithsonian institutions located on the National Mall – the National Museum of African American History and Culture (NMAAHC). Meanwhile, as far as the eye could see, hundreds and hundreds of men, women and children lined the grounds surrounding the museum, watching the program on Jumbotrons, periodically shouting their affirmations throughout as participants including Stevie Wonder, Will Smith, Oprah Winfrey, Robert De Niro, Angela Bassett, Patti La- Belle and an acapella jazz choir from Howard University mounted the stage. President George W. Bush and his wife, Laura, also joined the special guests on stage. Bush, passionate in his remarks, shared one statement that elicited a roar of agreement from the crowd and which Obama would reiterate during his address.